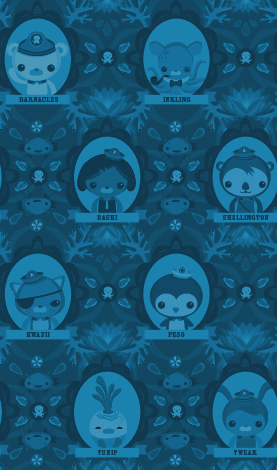 Captain Barnacles is a brave polar bear extraordinaire and the leader of the Octonauts crew. He's always the first to rush in and help whenever there's a problem. Besides adventuring, Barnacles enjoys playing his accordion and writing in his captain's log. Kwazii is a daredevil orange kitten with a mysterious pirate past. He loves excitement and travelling to exotic places. His favourite hobbies include long baths, racing the Gup-B, and general swashbuckling. Peso is the medic for the team. He's an expert at bandaging and always carries his medical kit with him in case of emergencies. He's not too fond of scary things, but if a creature is hurt or in danger, he can be the bravest Octonaut of all! Dashi is a smart dachshund / sausage dog who oversees operations in the Octopod HQ and launch bay. She monitors the computer systems and manages all ship traffic. She's also the Octonauts' official photographer and enjoys taking photos of undersea life. Dr. Shellington is a nerdy sea otter scientist who loves doing field research and working in his lab. He's easily distracted by rare plants and animals, but his knowledge of the ocean is a big help in Octonaut missions. Tweak is the engineer for the Octopod. She keeps everything shipshape below deck in the engine room and maintains all Octonaut vehicles: GUP-A to GUP-E. Tweak loves working with machinery and building strange contraptions that sometimes work in unexpected ways. Professor Inkling is a brilliant, Dumbo octopus oceanographer. He founded the Octonauts with the intention of furthering underwater research and preservation. Because of his delicate, big brain, he prefers to help the team from his library in the Octopod.